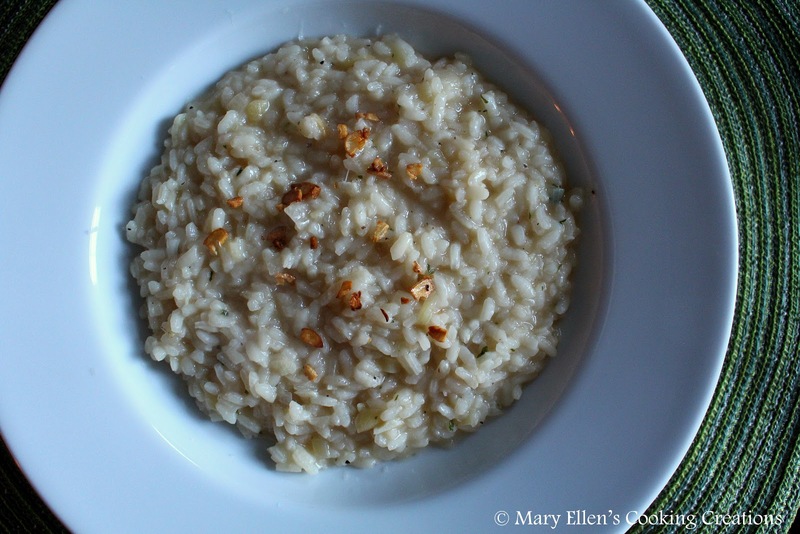 Garlic can have so many different flavors that can be achieved in the way you use it in a dish. When raw it is very aromatic yet spicy and sharp, while roasted garlic is sweet. Sauteed garlic mellows out quite a bit, but still adds great flavor to dishes. Finally, toasted garlic (not burnt!) takes on a caramelized flavor, but different from the slow roasted sweetness you get in roasted garlic. Many years ago I first made this risotto, and over the years have tweaked it, so I am sharing this updated version with you. I know, one-and-a-half cloves of garlic seems like a LOT for one dish that serves 4 people. But believe me, by cooking the garlic three different ways - roasted, sauteed, and toasted - you will get many layers of garlic flavor that all add something to the dish. Preheat oven to 400 degrees, Chop the top (the non-stem side) of the full bulb of garlic off to just slightly expose the garlic. Place the full bulb of garlic cut side up in a ramekin lined with foil. Pour 1 tsp olive oil over it and gently close up the foil. Place in the oven for 30-40 minutes; the garlic cloves should be soft and golden brown (see second picture above). 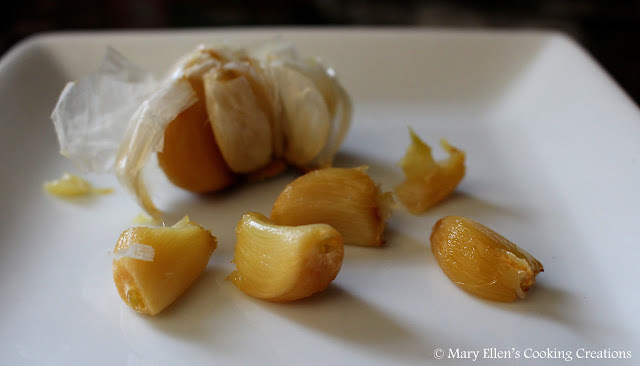 Remove from the oven, let cool,and squeeze garlic cloves out of the paper skin. This step can be done ahead of time - if you roast it early in the day, you can keep it covered on your counter. If you roast it a day or two ahead of time, place it in a covered container in the fridge. Chop roughly before using. Heat 1 Tbsp olive oil in a large saute pan over medium-low heat. Add half of the chopped raw garlic and cook in the oil, stirring almost constantly, until the garlic turns crispy and gets a nice, golden brown color. You want to be very careful during this step to toast, not burn, the garlic. Remove it to a paper towel as soon as it reaches the color you want - even a few seconds too long could ruin the garlic. Melt butter in the pan and turn the heat up to medium. Add the shallots and the rest of the chopped raw garlic; saute 2-3 minutes. Add the wine and stir until it has all absorbed. Add 1 large ladle of the broth as well as the chopped, roasted garlic. Stir, mashing up the roasted garlic, until all of the broth has absorbed Continue adding broth, 1-2 ladles at a time, stirring constantly. Do not add more broth until the previous broth has completely absorbed. This process will take about 18 minutes. 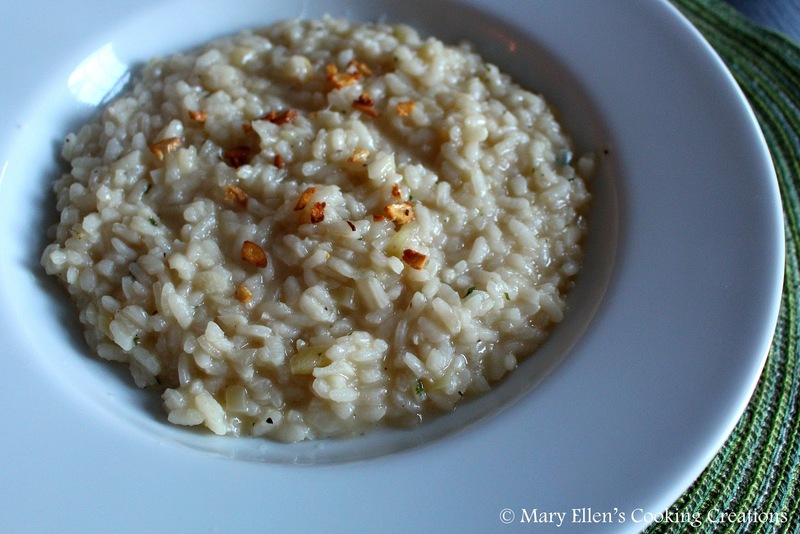 Starting at about 15 minutes, start tasking your rice - you want it cooked to al dente - soft with just a touch of resistance when you take a bite. Stir in the Parmesan cheese and parsley, and season with salt and pepper to taste. Serve immediately.